Application: Pozidriv, Phillips, Slotted and torx screws. Design: 10-piece set in a hard plastic case. The handle/interchangeable blade system permits rapid exchange of the blades needed for a wide range of applications. The tools can be stored and carried in a solid plastic case for easy tool access. The sets come with a Kraftform handle, quick-release chuck and bits for manual and power tool operations. Rapid-in and self-lock, Rapid-out, Chuck-all, Single-hand function. The 05056653001 Wera Kraftform Kompakt 10 Piece Set is one of thousands of quality tooling products available from MRO Tools. Please browse Wera Kraftform Kompakt and VDE Sets for tools similar to the 05056653001 Wera Kraftform Kompakt 10 Piece Set. 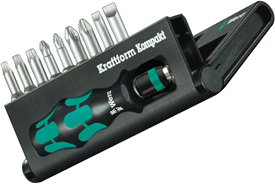 05056653001 Wera Kraftform Kompakt 10 Piece Set description summary: Wera Kraftform Kompakt 10 Piece Set includes 1 bit-holding screwdriver 813 R Kraftform with quick-release Rapidaptor with rapid in and self-lock technology. Quantity discounts may be available for the 05056653001 Wera Kraftform Kompakt 10 Piece Set. Please contact MRO Tools for details.